About me: 60 years later, I still like to raise queens. And I produce a limited number of them. As I write this my major concern is how I can produce enough queens to provide for the customers that have requested them. I really don't want to spend 10 to 12 hours a day in the bee yard. If you would like to read more about my queens, visit my web site: www.ohiobuckeyebelle.com site. This picture shows me over 20 years ago. I raised bees in Ohio and Georgia and had a few bee yards in Indiana as well. My income was based on selling package bees and raising queens. If the bees made any honey, it was a bonus for me. It was a good time and I could expect that most of my bees would be alive from year to year. I also remember it as a hard life. Many beekeeper do not get up in the morning in central Ohio and go to sleep near Pineview, Georgia. My routine in early spring was to leave the Columbus area and drive 700 plus miles on a Monday to work bees in Georgia on Tuesday, Wednesday, Thursday and head home by noon on Friday so I could deliver package bees from my own hives to customers who would show up at 7:30 a.m. expecting to pick them up. A good friend, Dan Grant, also a commercial beekeeper, said to me one day "You look like death warmed over". I didn't say anything because all I wanted to do is find a bed and drop in it after working all day Saturday hoping everyone would pick up the package bees early. Some didn't. I now live in retirement in Madison County Ohio. Retirement is raising a few queens. 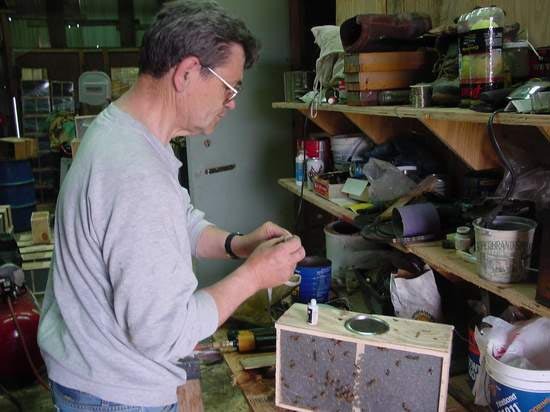 I have raised queens for many years starting when I was 16 years old and had an accident with a Kelley Hive Loader. You don't see them around any more because they were a bit dangerous to work with -- OSHA would have a field day with anyone trying to sell anything like it today! I broke my right wrist and could do no heavy lifting. But because I was in a beekeeping family -- I did not get a vacation. Raising queens is quite different than honey production. It doesn't require a lot of lifting. I was taught the skills required to produce queens. I was not good at grafting -- that requires a bit of wrist action that the accident made impossible. But I was working every day learning how queens are raised and decided that part of beekeeping was fun -- more fun than standing on my feet all day extracting honey. I also learned how to work bees without a bee veil because the hives were small and one can see much better without a bee veil. Getting stung was just a fact of life when I was young. 60 years later, I still like to raise queens. And I produce a limited number of them. As I write this my major concern is how I can produce enough queens to provide for the customers that have requested them. I really don't want to spend 10 to 12 hours a day in the bee yard. If you would like to read more about my queens, visit my web site: www.ohiobuckeyebelle.com site. If you would like to contact me: Dana Stahlman, 7245 Neil Road, London, Ohio 43140 and my home phone number is 740-852-3598. My email is: stahlmanapiaries@aol.com I am not usually available until late in the day.